About 1,000 people have been evacuated from a coastal caravan park in North East Lincs amid fears that flooding and a high tide may endanger life. Council officials are moving people from the Thorpe Park Caravan Park in Cleethorpes as a precaution. Hundreds are in a leisure centre in the town while others are being looked after at Grimsby's town hall. 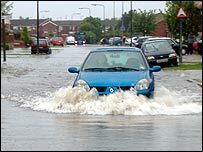 Heavy rain and flooding in East Yorkshire and northern Lincolnshire saw police declare a major incident. 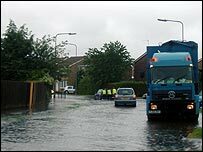 One of the worst-hit areas was Hessle in west Hull where police reported two square miles of severe flooding. Officers warned residents not to wade through the water because it was contaminated with sewage. Many roads and schools in the region were closed and the Lord Mayor's Parade in Hull has been cancelled. Humberside Fire Service said it had received so many calls it had been forced to respond to them on a priority basis. Anyone needing help should call the fire service floodline on 0845 9881188. Officials said they had taken staff off leave to help deal with the volume of calls they had received. A fire service spokesman said: "We are advising the public that they should only call the fire service if there is an immediate risk to an individual's health or safety. "Our advice is to remove valuable items to a higher level, turn off the electricity and gas supplies and wait until the rain stops and the water level recedes." North East Lincolnshire Council set up an incident room at Grimsby Town Hall, comprising key officers from across the council to coordinate the council's response to the flooding. More than 70 streets and roads across the borough had been affected by surface water. Eleven schools in the East Riding were shut, including Withernsea High School and South Hunsley School. Hull City Council said it had called off Saturday's Lord Mayor's Parade, which raises thousands of pounds for charity, "for public safety reasons". "We are extremely disappointed to have cancelled the event for the first time in its history," a spokeswoman said. He said there was standing water on many routes and reports of manhole covers being lifted. Major routes including the A1105 Boothferry Road in Hull and the Peaks Parkway in North East Lincolnshire were also closed. Hull's biggest primary school football tournament, the Festival of Football, has also been postponed due to the weather. The event, which was due to take place on Saturday, will now take place on 23 June.